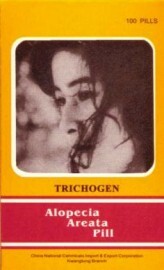 Ban Tu Wan, Alopecia Areata Pill, is a natural herbal supplement for hair. Herbalists routinely use the herbs in this formula to nourish the blood, guide qi and promote circulation, and to provide the herbal nutrients for all your hair needs. 100 pills one bottle, manufactured by Guangxi Wuzhou Ying King. Enriching the liver and kidney, nourishing the blood and quieting the spirit, supplementing qi and engendering hair. Use for alopecia areata, general alopecia, baldness, seborrheic alopecia, alopecia due to the blood vacuity, alopecia after childbirth or after a serious disease. Directions:As a dietary supplement, take 4 to 6 pills 3 times a day with warm water. For the best result, take it for 3-4 months.